That Japanese variant of the Galaxy SIII with 2GB of RAM wasn’t a myth after all. Announced this afternoon, we have the Canadian GS3 variants that interestingly enough, also contain 2GB of RAM and will be available on June 20. One thing that may disappoint some of you is the fact that they will sport Qualcomm’s dual-core 1.5GHz Snapdragon S4 processor rather than Samsung’s quad-core Exynos, but try not to let it get you too down. The S4 is a beast in its own right, loves LTE, and should give you some of the best battery life we have seen yet on a smartphone while continuing to power through all tasks. And again, 2GB of RAM here, folks. Now, what immediately came to my mind after hearing this is, “Umm hello, 2GB of RAM in the U.S. variants as well?” Thanks to this benchmark, we are pretty sure that Verizon’s Galaxy SIII will also rock the Snapdragon S4 and a similar setup to these Canadian GS3s. Who’s ready for some 2GB action? The ‘Buddy photo share’ function also allows photos to be easily and simultaneously shared with all friends pictured in an image directly from the camera or the photo gallery. ‘AllShare Play’ can be used to instantly share any forms of files between GALAXY S III and tablet, PC, and televisions that are DLNA enabled, regardless of the distance between the devices. The ‘Group Cast’ feature that allows users to share their screen among multiple friends on the same Wi-Fi network; users can comment and draw changes at the same time as co-workers- witnessing real-time sharing on individual devices. The preloaded ‘Dropbox’ application provides an even more convenient sharing experience, supplying 50GB of free storage for two years for not just image and music files, but now also for video content. 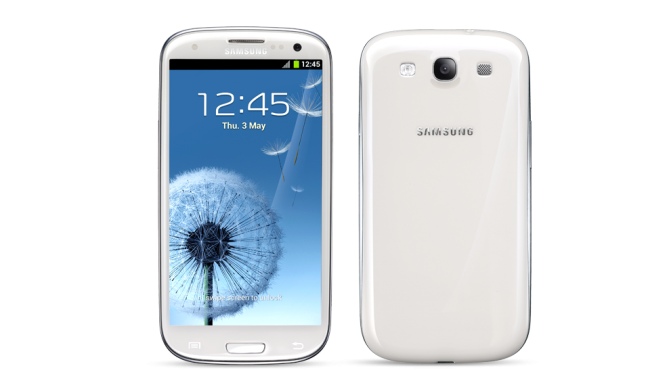 With the GALAXY S III files can also be instantly uploaded through data networks without requiring WiFi access. ‘Pop up play,’ users can play a video anywhere on their screen while simultaneously running other tasks, eliminating the need to close and restart videos when checking new emails or surfing the Web. An 8MP camera features a zero-lag shutter speed that lets users capture moving objects easily without delay, with the‘Burst shot’ function that instantly captures twenty continuous shots, and the ‘Best photo’ feature that selects the best of eight photographs, the GALAXY S III ensures users a more enhanced and memorable camera experience. With Samsung Hubs, users can continually refresh phone content through the ‘Game Hub,’ which provides access to numerous social games, while Video Hub, a new service offering to the Canadian marketplace, brings users high quality TV and movies for rent . Furthermore, Samsung Music Hub will offer a personal music streaming service. ＊Android, Google, Android Beam, Google Search, Google Maps, Gmail, Google Latitude, Google Play, Google Plus, YouTube, Google Talk, Google Places, Google Navigation, Google Downloads are trademarks of Google Inc.